An all new Griswold adventure is ready to rolll! 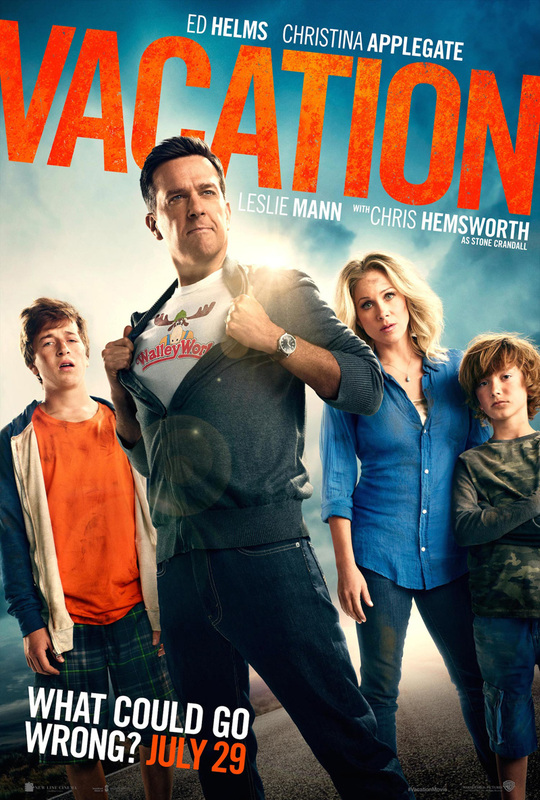 Warner Bros. Pictures and New Line Cinema have revealed the Vacation trailer and you can view the trailer below! The movie also stars Leslie Mann (This is 40) as Audrey Griswold-Crandall, Chris Hemsworth (Thor) as Stone Crandall, an up-and-coming anchorman and Audrey’s husband, Charlie Day (Horrible Bosses), who plays a river rafting guide as well as Chevy Chase and Beverly D’Angelo reprise their roles as Clark and Ellen Griswold from the original film. The movie is directed by Jonathan Goldstein and John Francis Daley in their directorial debut. The duo also wrote the script. This entry was posted in News, Trailer and tagged Beverly D'Angelo, charlie day, Chevy Chase, chris hemsworth, Christina Applegate, Ed Helms, Leslie Mann, Skyler Gisondo, Steele Stebbins, vacation by Michael Petrelli. Bookmark the permalink.